This story was updated Sunday (May 1) at 9:31 a.m. EDT. CAPE CANAVERAL, Fla. – NASA has delayed the final launch of space shuttle Endeavour once again, deciding not to try to lift off the shuttle Monday as was hoped. A new launch date has not been set, as mission managers will need time to determine how long repairs to a broken power unit will take. 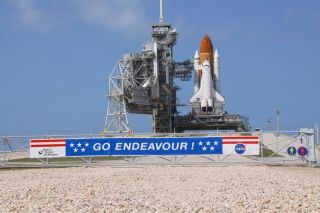 "We're looking more toward the end of the week, maybe next weekend" to launch Endeavour, NASA spokesman Allard Beutel told SPACE.com. "We won't know until tomorrow when our next launch opportunity is." "This was a pretty straightforward scrub," said launch director Mike Leinbach during a press conference Friday afternoon. "We don't like lifting off without redundancy especially in a critical system." Two heaters that are supposed to keep the power unit from freezing on orbit failed, which would have rendered the APU useless once Endeavour reached space. Engineers have yet to isolate the root cause of the problem, but inspections conducted Saturday point toward a failed avionics box, which powers the heaters that protect the critical unit. Fixing the problem will likely take some time, partly because the broken element is in a hard-to-reach area of the shuttle's aft section. Friday's attempted launch was to be witnessed by a crowd that had swelled up to 750,000, as well as President Barack Obama and his family. The Obamas visited the Kennedy Space Center anyway, and took a tour of the facility where the shuttle Atlantis is being prepped for its last launch on June 28. "Even though we scrubbed, the president elected to continue with his visit to the Kennedy Space Center with his family, and I think he really enjoyed it," said Bob Cabana, director of the Kennedy Space Center. "I think it was great that he came down today." Also hoping to view the launch was Congresswoman Gabrielle Giffords, D-Ariz., who was here to watch her husband Mark Kelly fly aboard Endeavour as its commander. Giffords was shot in the head during an assassination attempt in January, but has reportedly made great strides in recovery. She had traveled from her Houston hospital to Kennedy Space Center for the launch. Endeavour is due to carry six astronauts on one final visit to the International Space Station. Endeavour will deliver a $2 billion astrophysics experiment to search for antimatter and dark matter, and a platform full of spare supplies for the station.